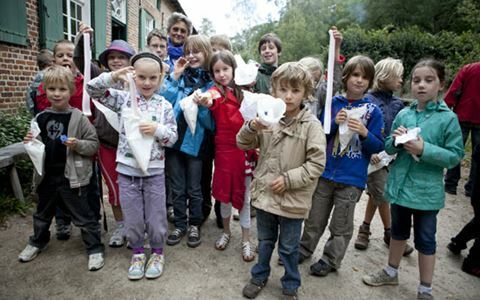 Bokrijk Open-Air Museum is the perfect place for a school or youth club outing. Children and young people can experience and relive life in the past, thanks to fascinating interactive programmes. We can also design programmes tailored to your requirements. Pre-school, primary school, secondary school and youth club groups will all find things to their liking. In other words, fun and educational at the same time! Book now via the reservation form. For more information, please send an email at any time to bokrijksales@limburg.be. Check out this list on where to eat and drink in Bokrijk. 't Poorthuys means ‘the Gatehouse’ in English, and, as the name suggests, it is located at the entrance to Bokrijk Open-Air Museum. In the spring of 2017, the original building from 1774 was converted into a cosy bistro. Chef Jeff Beyens brings a contemporary cuisine and Peter Janssens receives the guests with style. Attractive inn near the Kempen village square, with a large bar room and spacious pleasant outdoor terrace. Local dishes, such as traditional farmers’ meals, Flemish chops and buckwheat cakes, can be enjoyed here. This inn was originally built in Lier in 1775, and was recently completely renovated. The result is a fresh and contemporary interior built from honest and sustainable materials, which manages to retain its authenticity. Tavern-eatery with West Flanders specialties. The building was transferred here from St.Rijkers near Veurne in 1978. Suitable for groups of up to 20. Homely pub in the Haspengouw section of the Open-Air Museum. Perfect for small dishes and snacks. Suitable for groups of up to 25. A hypermodern hangar with a view of a fairy tale-lit ancient city, hidden in the green panoramas of Bokrijk. HANGAR58 is the only event venue in the region where a city is exclusively yours. With their all-in service and personal approach, the H58 team creates a unique framework and set-up of your next private or business event, fair or family day. For 250 to 5000 guests. If you’re interested in what kids liked eating in the olden days, simply ask the sweetshop assistant and taste it yourself! This sweetshop only sells handmade sweets made according to old recipes. Enjoy your sandwiches in the open air at one of the many pleasant picnic areas in Bokrijk.